After almost 15 years in the diversity & inclusion business I’ve noticed something pretty consistent: the word “diversity” is defined one way, but used a different way. I’m sure there are many other similar “dilemmas”, but this one has unique implications because of the fire behind the word. Let me explain. A common explanation of workforce diversity has become “a mix of differences and similarities” (or something similar). This broad definition allows the inclusion of multiple differences that someone might bring to the team, from the usual suspects of race/gender/age/sexual orientation, to the not so obvious family status/workstyle/religion/hobbies/etc, and even the organizational influences like management level/department/work location/etc. 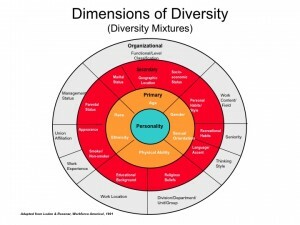 Those of us known as diversity practitioners expanded the dimensions of diversity beyond the affirmative action components in an attempt to show that EVERYONE is included and thus should have a vested interest in leveraging these differences & similarities to produce better workplace and marketplace results. Essentially, we’ve made “diversity” synonymous with “people”. Make sense, right? So what’s the problem? When talking to someone in the business world, any given week I’ll hear something like “we don’t have any diversity on the team” or “are companies still looking for diversity?”. With our expanded definition, however, this translates to “we don’t have any people on the team” and “are companies still looking for people”. Now that sounds CRAZY! So our dilemma has become staying with the expanded, more inclusive definition, while struggling to use a word that describes the specific dimensions of diversity that are desired in a given situation. For example, if I’m a white male and I hear “we need some diversity on the team”, I’m thinking “don’t we already have people on the team? What’s the problem?” On the other hand, I can recall many discussions within the African-American community (especially back in the 90s) centered on the expanded definition of diversity was watering down the still needed expanded talent search push of Affirmative Action. A Solution: Build your business case and get specific on the why and what dimensions are desired. For example, say “we’re expanding our talent search for racial/ethnic or gender diversity because we lack mixed representation in those areas and understand the benefits of having multiple perspectives based on differing cultural backgrounds”. I know that seems like a mouthful, but it starts to more effectively communicate that 1) while we understand there are many dimensions to diversity we’re only talking about a few in this specific discussion and 2) we are identifying why we even need/want a more representative mix on the team. Of course, we’re only touching the surface of diversity with this topic on representation. In later discussions, we’ll address actually doing something with differences to produce better results…and working through the inevitable tension in the process. With the launch of our new web site we are looking to better communicate with our clients. Please tell us if you find the site helpful and how we can improve.